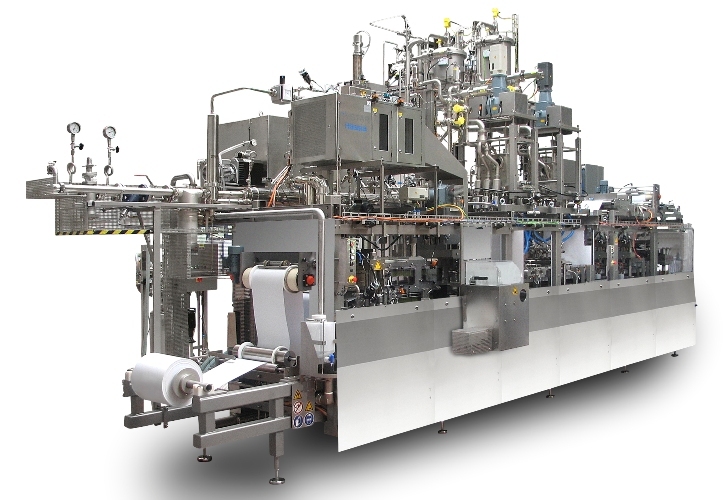 Dairy companies are maximizing the production potential even in the smaller output range with the purchase of the aseptic “TAS 8/48” from OYSTAR Hassia: The compact FFS machine packages a wide variety of cup shapes and sizes with numerous products – to the highest standards of hygiene. This is made possible by the “steam aseptic” technology made successful by OYSTAR Hassia. With this process, sterilization is achieved by means of saturated steam. This is a natural medium that is free of harmful substances and is available in most dairies anyway. The steam system guarantees a disinfection efficiency of >log4, which means a maximum of one non-sterile cup per 10,000 cups. Sterilization is achieved solely through the effect of moist heat. The TAS 8/48 produces up to 12,600 rectangular, cylindrical or oval cups per hour. The FFS machine is just as flexible when it comes to cup sizes, with quantities ranging from 105 ml to 125 ml, 180 ml right up to 400 ml. The use of a multi-punch tool facilitates the production of single, dual, quartet, sextet or octet cups. The cups are filled with products such as sour cream, quark desserts, yoghurt or fruit pulp. At the same time, the TAS 8/48 is fast and flexible to operate: changing the 6-up format from cylindrical to oval cup shapes takes only 20 minutes. The same applies to the second format, which forms, fills and seals the 3-up rectangular and is designed with two cup depths for 180 g and 400 g cups. A complete format change, i.e. 3-up to 6-up takes around 90 minutes. In addition, the cylindrical and oval cups can be decorated with a label. Measuring approximately 10 m in length and 1.6 m in width, the FFS machine takes up very little space. The TAS 8/48 thus helps to optimize efficiency and profitability.